The Pride Festival travels the country hitting major cities along the way. 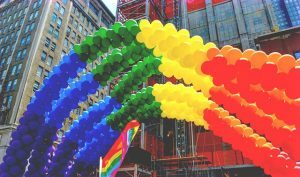 Detroit, also known as the Motor City, has been the on and off home of Michigan’s LGBT pride parade since 1986. Since then, the parade has evolved into a weekend long festival that is hosted by three different non-profit charities. If you are in the Detroit metropolitan area during the weekend of June 9th and 10th 2018, we suggest you check it out. The pride parade began as a civil rights movement for the LGBT community. The movement quickly gained traction as individuals of this community believed that they were often being singled-out and discriminated against. In 1986, the pride parade came to Michigan for the first time. From 1986-1988, the civil rights movement trotted through the city and ended at McGregor Center on the campus of Wayne State University. By 1989, the parade had gathered a good amount of momentum. In order to capitalize on this, the committee decided to move the location of the march to Lansing, Michigan. The reasoning for the move was because Lansing is a more central city of the state and the committee wanted to attract as many people as they could. Detroit felt abandoned by the move. In the same year, Frank Colasonti Jr. founded the very first Gay and Lesbian Pride Festival. From this point, the festival only grew. In 1990, the name of the festival was officially changed to PrideFest. In 2003, the festival would once again undergo a rebranding as the name changed to Motor City Pride. By 2009, the festival registered over 35,000 participants and featured over 200 performers. Nowadays, the festival begins with a parade on Griswold Street and ends at the festival hub in Hart Plaza. In 2018, the Motor City Pride Festival will be held on June 9th and June 10th. The cover charge for this year’s festival is $5.00. However, children 12 and under will be granted free admittance. If you are planning on driving your car to the event, there are plenty of parking garages nearby. If you are going to ride your bike to Hart Plaza, there will be a bicycle valet service east of the main entrance. Food and beverages will be available at the event. According to the website, there will be about 14 different food trucks. AS far as beverages go, you will not be permitted to bring outside beverages into the festival. Bottles of water will be sold for one dollar USD. The event will have a bevy of alcoholic beverage options featuring Miller Lite, Summer Shanty, a variety of frozen slushies, and Deep Eddy Vodka drinks. Smoking is only permitted in designated areas. Restrooms will be provided on the festival grounds. Pets are permitted if they can walk on a leash, but it is not recommended that you bring your furry friends. On June 10th at 8PM, the festival planners have sectioned off a time slot where festival-goers are encouraged to gather for a vigil. The festival committee is planning to honor those who have died in the LGBT community, including the 49 lives that were lost in the Pulse Nightclub shooting. If you are in the Detroit metropolitan area in the second week of June, check out Motor City Pride Festival.